Well, ok, maybe it is, but I had to try for a catchy post title. Who can blame me? 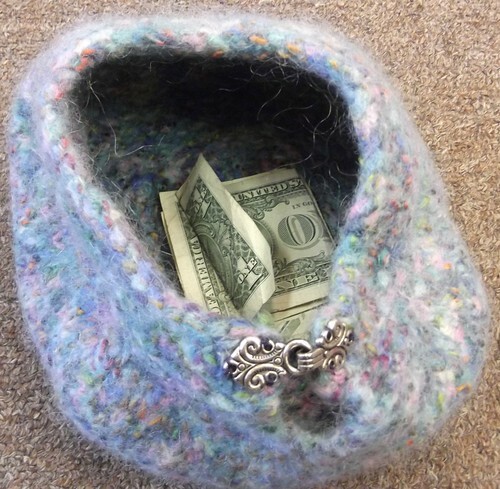 We start this post with an update on that yarn bowl in the middle of the table meant to collect money when the phone is answered with the wrong greeting. We are doing quite well. There are only two dollars in there so far (both contributed by the same person, who shall remain nameless). I was personally hoping for a few more trip-ups so we could use the money for something fun or yummy, but alas, it looks like I may be disappointed. We still don’t have our credit card processing up and running, but have no fear, it won’t be long now. …and of course she’ll be stitching a stocking with lots of pink in it. I promise to show it to you when it’s done. Now on to the knitting and needlepoint stuff. We are going to start a mystery knit-a-long on Mardi Gras. It won’t be difficult, I promise! To kick off this new idea, we are starting with a simple project that will be a great option for Christmas giving. For a mere $10 you will sample five different yarns and see a nice project through to the end having fun with your friends. You can ask questions, but we aren’t going to tell you what it is. You know you can trust us to pick something awesome. You will need to sign up and don’t worry, if you can’t start with us on Mardi Gras, it is easy enough to catch up. Remember the top ten reasons from last week? Reason #5 was to join the Frequent Finishers Club, the Chemo Cap Club or the Birthday Club. You may have been asking what we could have possibly meant by that. Well, let me enlighten you. First, we have the Frequent Finishers Club. Send ten needlepoint projects for finishing through The French Knot and get an eleventh (of equal or lesser value) free. Next up is The Chemo Cap Club. Donate ten preemie or chemo hats and we will give you 10% off your next purchase. Last, but not least, is the Birthday Club. For this one we need your email address and your birthday. We will send you an email and you get 20% off a purchase during your birthday month. Pretty cool stuff, don’t ya think? And now for those finished objects. 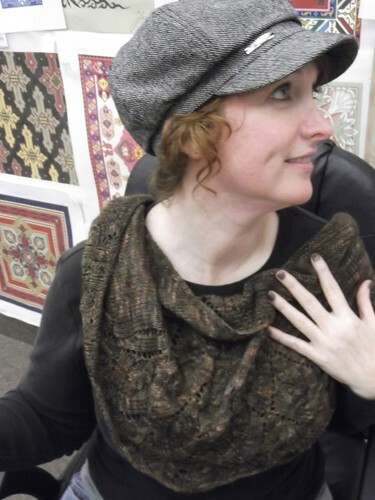 The lovely Suzanne models Bryce Canyon, knit by Leona using Malabrigo Sock yarn. Also modeled by Suzanne is a pair of socks knit by Julie. Jane finished a hat with Noro Silk Garden. Ann dyed this yarn and then knit a hat with it. Lavish Praise, Ann. Leona threw together this throw in a couple of days, it will reside on a friend’s couch. Avra stitched this adorable canvas. She sent it off to be finished as a pillow. Terry finished this inch worm. It will be a pillow when it comes back. Geogie’s pillow came back. She made it for her daughter. Pretty, isn’t it? Top 10 Reasons to Come to The French Knot.